Christians are using a double-decker icon of Northern Ireland history to share a new story on the city streets. 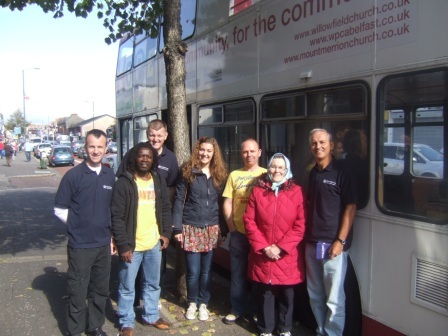 Anglican evangelists have decided to get the bus to conduct their parish ministry in Belfast. They’re even driving it.They are outreach workers from Willowfield Parish Church – headed by Church Army evangelists George Newell and Richard Waller. They use a HOPE bus to connect with the community. HOPE is an initiative encouraging churches to work together in ‘word and action’ mission across these islands. The loaned double-decker has already attracted attention with a fun day and barbecue on the field where footballing legend George Best used to play. It’s even been on an Orange parade, when thousands of locals line the streets to watch the marching bands. Bus workers have been among the heroes of Northern Ireland history. And thanks to this congregation, they continue to be a driving force fo r community transformation. During ‘the Troubles’, public transport took a heavy toll. Staff were killed and injured. Hundreds of their vehicles were damaged or destroyed. Now this different kind of crew take their different kind of bus down Belfast’s streets. Every Saturday, they drive the vehicle from the city’s world famous Titanic Quarter, and down the Cregagh Road to support their Healing On The Streets initiative. But why did the vehicle join an Orange parade – which in many people’s minds is linked with sectarianism? "This is the largest local community event in the year," said George Newell. "While we may not agree with everything that happens at such an event, it’s a brilliant opportunity to make contact with thousands from the local community. 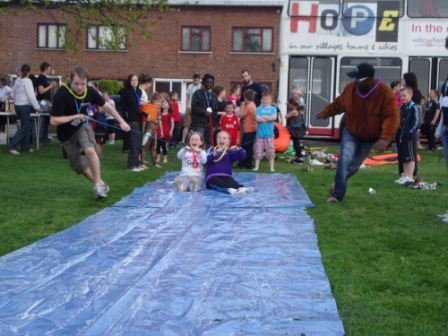 By giving away juice and hotdogs, we can demonstrate something of the amazing grace and love of God." ’s and Orangefield Presbyterian Churches – to help tidy up the Cregagh estate. The vehicle is on loan from Associated Bus Ministries. Three church workers have been trained to take the vehicle wherever it needs to go. They picked up some valuable advice. "The instructor told me, 'never lose your sense of humour'," quipped Richard Waller, Willowfield’s bus co-ordinator. "The bus is like a honey pot. And people miss it if it isn’t there."